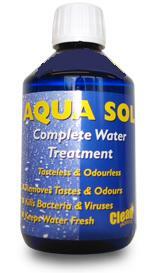 Aqua Sol - is a complete water treatment that treats 625 litres of water. Tasteless and odourless and easy to use. Simply add 1 capful (10ml) to every 25 litres of water. Aqua Sol kills bacteria and viruses, removes tastes and odours caused by plastics, chlorine and metals and helps keep water fresh.